Would you like to become a football tipster? Would you like to become THE expert in your field of football betting? Would you like to make money from these endeavours risk free? Well if you answered yes to any of these then you are in the right place. And, I did mean that in the last question. Risk free. That was not a mistake. You see in this report you are going to learn how to do just that and with a bit of time and effort on your part you can be earning a nice steady income with this method. 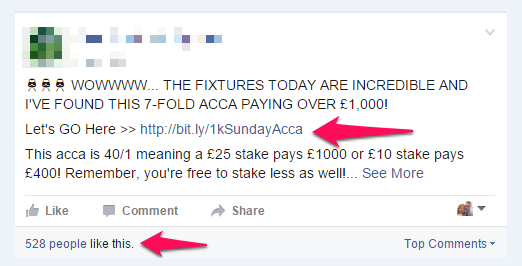 Now, the football tipsters I am talking about are the ones who work on FB. All of these “tipsters” main income is usually from one thing. And that is NOT bets. Nope, their main income will have nothing to do with their betting slip. Their main income will be with the betting companies that they are promoting. 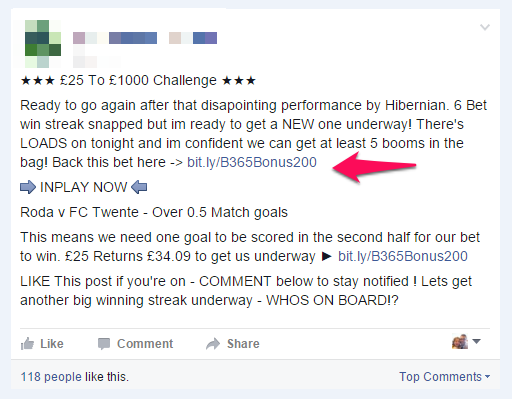 A common one used across FB is Bet365. You can see here that they will pay up to 30% per sign up. 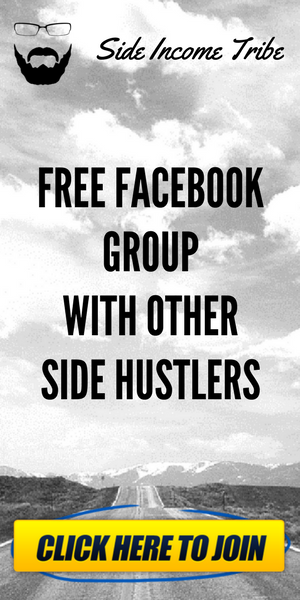 Now the question is what does this have to do with FB and how do they get to earn money through commissions? All these FB pages claim to have the inside knowledge and the advantage over traditional players. They claim to research all the games first and give you an edge. This is garbage, and again I will show you what they do in just a bit. You will see from the many groups posting they ALWAYS include a “sign up here to play” link. This is a short affiliate link to Bet365 where anyone who signs up through this link will be credited as an affiliate of theirs. The best part? They will earn 30% of whatever their newly signed affiliate LOSES for life. So let’s say they sign up and deposit £200 in their new account. When they lose that money (which they will eventually, gamblers always lose in the end) Mr affiliate will earn £40 of that stake and 30% of their losses forever. That is a pretty good return. You see even if your newly signed member goes on a little winning streak you are still fine. By Bet365’s own admission you can have a positive balance (meaning the person is winning more than they lose) but generally they will lose eventually. You always do. 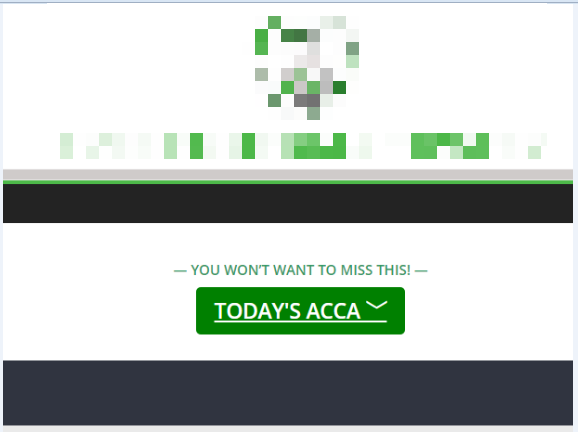 Ok so now we have established that they earn money through the Bet365 affiliate system what about the actual bets they are telling you to make? Remember, they are claiming to be an expert in the field and give YOU the edge. But it can only be an edge, no outcome of ANY football match can be predicted 100%. 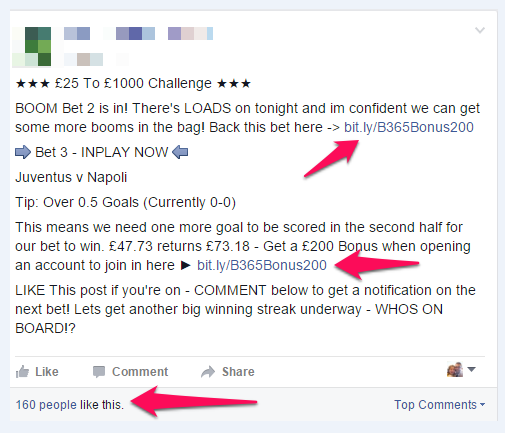 They usually offer two types of bets throughout the day on the Facebook pages. The accumulator and the in-play bet. These are a series of bets usually more than 4 games resulting in a high win from a small stake. These are always a gamble and rarely come in. Nobody can really be an expert in these but some will come in now and again. It’s a lottery really. The accumulator gambler is the bookmakers dream punter. Look at the social proof from the ‘likes’. There is also ton of comments on each post making the posts go viral getting new members to sign up and like the page each day. You can see that the bet is blurred out and locked out. 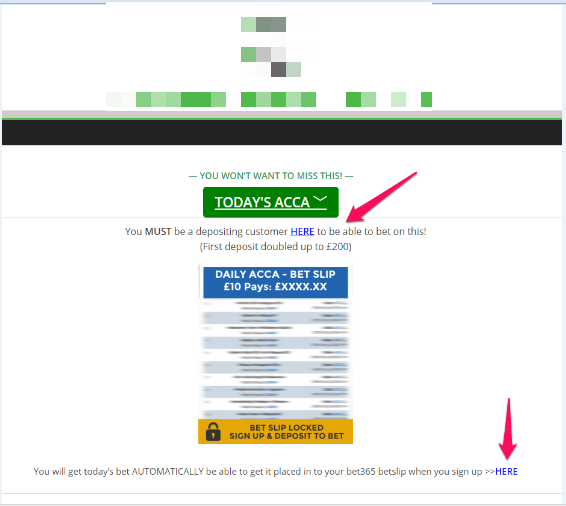 You will only get details of the accumulator once you sign up for a Bet365 account through the links. The nice 30% affiliate links. The real gold probably comes from the series of in-play bets that are selected. What is attempted here is to turn a small initial stake into a healthy large sum over a selection of bets. A popular one is the £25 into £1000 in-play bets. These bets are VERY SAFE bets with low odds. The type of bets here are usually that of a team or either team scoring just one goal. Here is an example, you can see the game has already started and it’s 0-0. The bet is for over 0.5 goals. This basically means ANY goal to be scored by any team. You can see by the expected returns from the bet (£73.18) that the odds would have been about 1.53 (decimal format). Also of course there are the Bet365 affiliate links for any new members to sign up through. Also again see the number of ‘likes’ the post has furthering its reach across people’s Facebook newsfeeds. As you can see the money can quickly accumulate in a nice healthy sum. So the plan is to bet the winning amount each time on each new bet. Once you have a run of 10 or so bets you will be earning some good cash. It is a good system and a good method. To be fair I have seen a couple of football tipsters hit this a few times. But Do You Need To Be An Expert To Pick These Bets? No. Not at all. In fact I put this to the test. On the weekend of Saturday the 13th February I managed to pick 7 in a row and turn my initial stake of £25 into £136.35. Here are the exact bets that I placed, in every game I only need one goal for the bet to come in. For example if the bet says over 1.5 goals then it would have been 1-0 or 0-1 when I placed the bet. There you go. I turned £25 into £136.35 over just 7 bets. I could have continued on but I just wanted to prove that it is achievable and I am by no means a football tipster or expert. I am also NOT a gambler. I like to use systems that can provide solid and safe income streams! But here is the best part. What happens if it goes wrong? What happens if one of the bets does not come in? This happens all the time. No matter how good the odds are, there is always one bet that does not go the way the odds intended it too. It is a football match! Well, when it goes wrong the tipster still makes money! Remember what I told you at the beginning about the commissions from Bet365? When a person LOSES their stake the tipster will get 30% so it literally is win-win for him. When a bet loses the tipster will just pick a new one and start the ball rolling again. As you can see in the image above bet 6 stopped the run to £1000 going. The tipster does not really care as this means for everyone who signed up through his link he would have made 30% of the losing stake on each person. The tipster simply starts a new one. He also gets everyone buzzing by telling them to ‘like’ and ‘comment’ on the post. And everyone goes crazy again. I also said at the top of the post that you also never need to make a bet. I hope now you can see why this is true. The Tipster does not actually need to make these bets because he is guaranteed profit whatever the outcome. Even if the bet does come in, the bookies are banking on the fact that the gambler will eventually lose that money on other bets (or slots, poker, bingo, plus others….) so the Tipstar cannot fail. Remember: the affiliate earnings are for the life of that individual. Although I would expect that the tipsters do actually make some of the bets. But they are doing so without putting their hand in their own pocket. You can see from this break down this is a very lucrative model. Something that when done right can work. The trick is to get a large following. This page I used in this example (although there are tons of pages doing this) has over 250,000 FB likes. That is a lot. People will most likely check these pages too or they will even have them in their preferred following so they get shown first each time there is a new update. In order to get really relevant ‘likes’ of this number to a FB page requires a lot of time and some investment. Though it can be done. 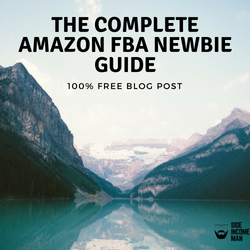 I have built numerous pages across numerous niches and got results very quickly and had strong engagement on the page. It can be done. If you want to learn how to build a website you can check out my free course here. Could you be the next tipster? How about taking it on a new angle? As long as the bets are safe, by safe I would say under 1.5 (decimal odds) then generally as a rule you will hit more winners than losers. This is great for your following as they will think you are a hero. But remember, you don’t care as you make 30% of of every bet that loses. For the record: I DO NOT do this, I find it a tad unethical. However if you want to enter the world of online tipping – then good luck!! How This “Indie Chick” Cleared Debt And Started To Build Wealth! 11 Of The Best Motivational Quotes To Inspire Side Hustlers! Spotlight #03 The Mum Who Fuses Glass, Sells on Ebay & Runs an Amazon Business! From time to time throughout this website I may place affiliate links on products or services that I use. If you decide to purchase any products or services through those links then I may receive a small commission at no extra cost to you.